Caring for Pets and the People Who Love Them! BOTH You AND Your Pet! is NOT ENOUGH to protect you . . .
are lifesaving aids in an accident or emergency. family doctor, and medical conditions and allergies. 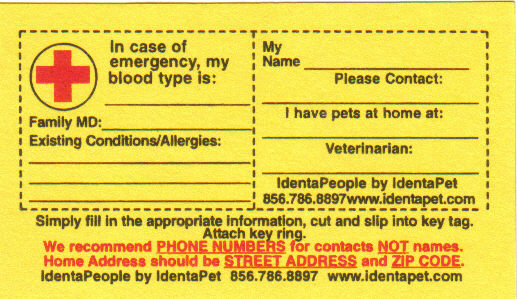 They also relay that you "have pets at home"
and who your pet’s veterinarian is! valuable time . . . at a time when EVERY minute counts! should the unforeseen happen, be prepared . . .
for YOUR sake, your FAMILY's sake, for PET’s sake! they are made from durable, amber colored proponate! They are “LIFETIME” tags for a “LIFETIME” of caring! They will NOT break, scratch or chip under normal conditions. They come with a large, heavy key ring. They measure 2” x 1 3/8”. discreet enough to be ignored by those who do not! Our Emergency Magnetic Cards are “Peel and Stick”. so they are easily accessible when necessary. emergency even when other family members may be available. is definitely the card "You don’t leave home with it”! ASPCA Emergency Static Cling Window Decal! This visible aid alerts emergency personnel in your community that you have pets should the unexpected happen when you are away from home or are are unable to speak for them. These non- adhesive stickers can be placed on any window. They work by static cling so they can be easily removed and positioned in a new location. Decals boldly declare "Animals Inside". 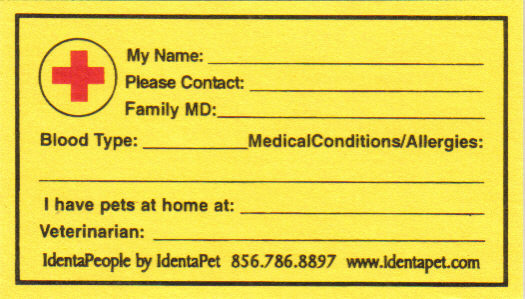 Simply fill in your contact information and you can rest easy knowing that your pets will be well taken care of during an emergency. These stickers measure 3 1/2 inches round. Shipping and Handling Charges for Contiguous USA Only. 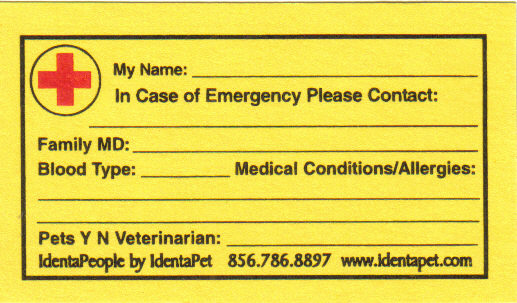 EMAIL IdentaPet ANYTIME for International Rates!!! in US Dollars ONLY payable to IdentaPet. Product Code # of the items you are ordering! We hope you'll recommend IdentaPet to all your FURiends. to return to Links and PETsMart Shopping! to return to IdentPet ORDERING! I can rest easy now, knowing my family cares enough to protect me with my very own IdentaPet PetSake Kit. Thanks, Mom and Dad!